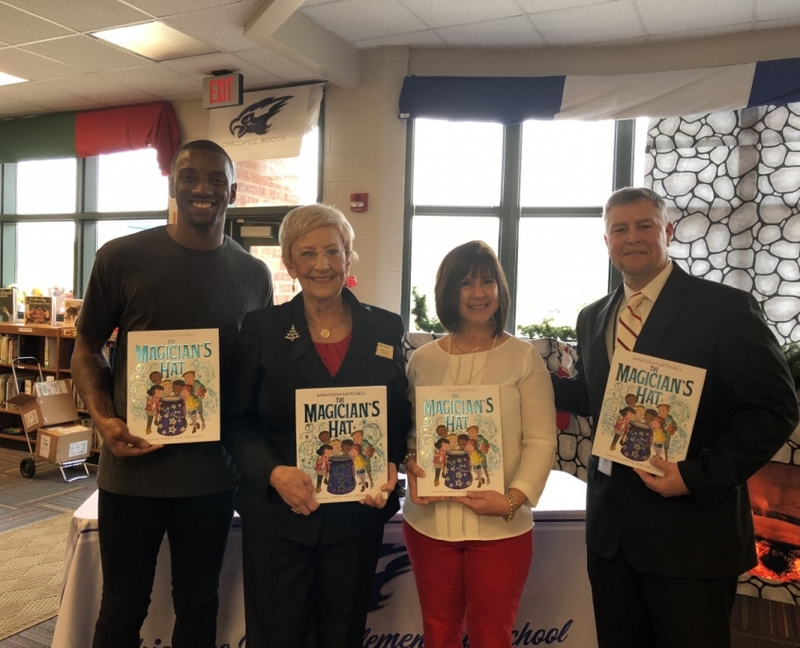 Malcolm Mitchell, former player for the Georgia Bulldogs and a Super Bowl Champion with the New England Patriots, brought his “Reading Rally” program to Chicopee Woods Elementary School on Friday, November 30, 2018. The program is an important component of Mitchell’s Share the Magic Foundation, which is devoted to advancing the importance of reading among children. Once the entire student body had gathered in the gym, Malcom Mitchell was introduced by Maye Smith, the 4th grade teacher who had applied for the grant for the rally. Mitchell immediately began to engage the students, encouraging them to shout out about the importance of reading. The atmosphere was truly that of a high-spirited pep rally, only on this occasion the source of the jubilation was not sports but reading. He inspired the students with his personal story of how his mother encouraged him as a young boy when he confessed to her that he felt very sad about having difficulty in reading in school. Once the students were truly engaged, Mitchell introduced magician Jeff McClure, who then proceeded to dazzle and delight the students with a series of magic tricks, which were a take-off on Malcolm Mitchell’s award winning children’s book, The Magician’s Hat (McClure, who tours across the state with the Reading Rally program, is a graduate of Johnson High School). Following the magic show, Malcolm Mitchell came back before the students and asked Georgia’s First Lady Sandra Deal to join him in a reading of The Magician’s Hat. For Mrs. Deal, who has made children’s literacy her primary mission as First Lady of Georgia, the event marked her 1,000th appearance at a school to promote the importance of reading. Once Sandra Deal had joined Malcolm Mitchell, he instructed the students to take out their copies of the The Magician’s Hat, which had been provided to the school through the grant, and to following along as he and Mrs. Deal read the story aloud. Following the rally, Malcolm Mitchell and First Lady Sandra Deal held a press conference for local and Atlanta Media in the Chicopee Woods Media Center. Mr. Mitchell also signed copies of his book, The Magician’s Hat for faculty and staff, as well as some very special students, two of whom were blind and were having braille copies of the book published for them.